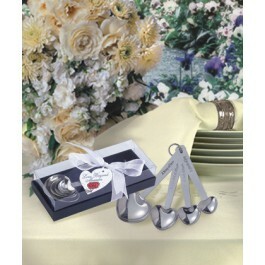 Boxed set of four heart-shaped measuring spoons, each engraved with a different "ingredient" to whip up a lifetime of bliss! 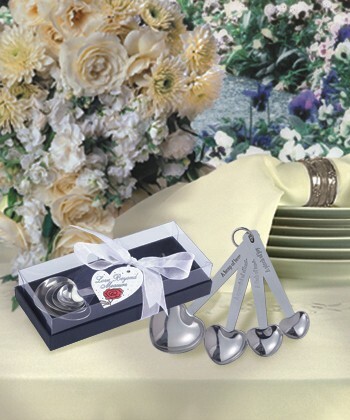 Each stainless steel spoon set is wrapped in a 6 1/2" x 2 3/4" box with a white satin ribbon, and includes a "Love Beyond Measure" gift tag. 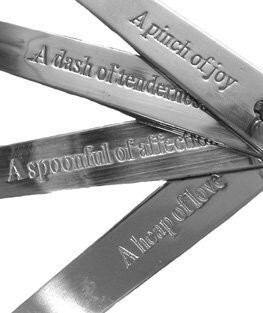 A refined, memorable favor sure to invoke inspiration in the kitchens (and in the hearts) of those who love to cook (and those who love to eat!) Spread the love and pass the sugar!